The career of the young Palatinate star chef Benjamin Peifer started when he, still a boy then, considered optimizing his mother’s pancake. He started off as a baker in the tranquil Palatinate lowland village named Weingarten. “And so on” is not quite what satisfies curious guests – they insist on getting the recipe. But they don’t manage to glean more than the home-made sourdough starter and ancient grain types, such as emmer wheat, einkorn wheat and quinoa that are used in the dough. The result is sensational. You will eat this bread as if you were tasting it for the first time in your life. 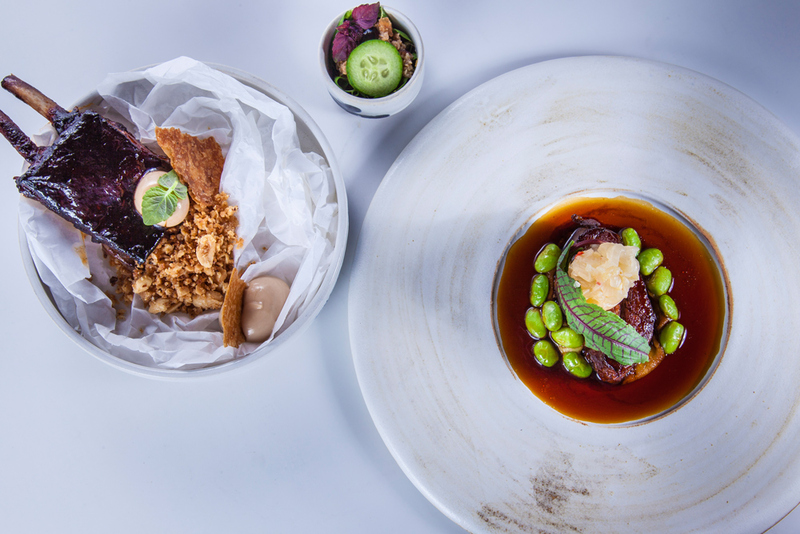 Sharp: At only 26 years of age, Benjamin Peifer has already achieved his first star and has redefined Palatinate cuisine. The courtyard of the building “Steinhäuser Hof”, located not far from the market square in Neustadt, takes the visitor into a scenery similar to that of Wagner’s opera “The Master-Singers of Nuremberg” – half-timbering, protruding oriels, and carved galleries. And one of the most renowned Palatinate gourmet restaurants, the “Urgestein”, stands in the background of this arrangement. The charisma of the locality unfolds through its architecture and interior, which is of simple elegance: leather armchairs under a cross vault ceiling made of clinker brick masonry. ”We offer a variety of seventeen individual dishes,” patron Hanno Rink tells us. He left the catering department of the casino “Spielbank Bad Neuenahr” behind him and moved to the Palatinate region together with his wife Hedi a good 15 years ago in order to take over the “Steinhäuser Hof”. Today, the guests come from the region and well beyond, including from Berlin, Belgium, Holland and from Switzerland to savour the culinary delight here. The menu starts with “Gequellde mit weißem Kees”. In fact, this Palatinate dialectal name refers to a dish consisting of potato crisp, curd cheese and paprika. Sounds absolute haute cuisine, right? This is a homage to the Palatinate region, as is the next appetiser: Dominik Hans’s “Elmsteiner Forelle” (trout from the town of Elmstein). 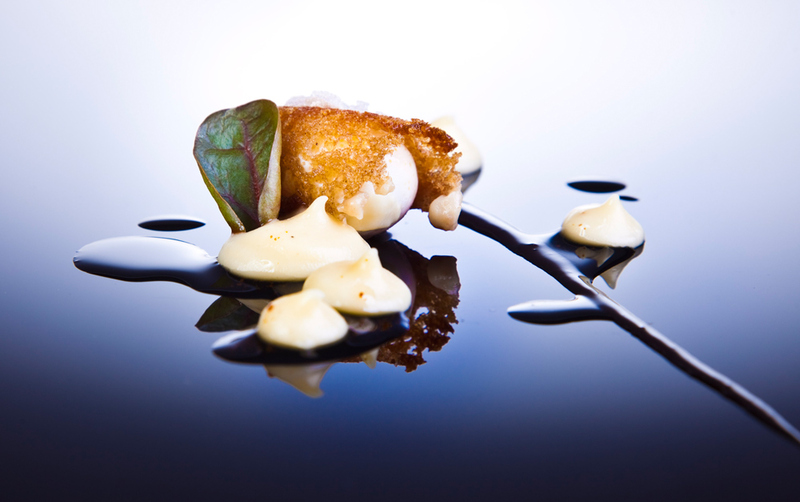 The third “amuse bouche” is of the same origin again: “Pälzer Gold” (Palatinate gold) – confit potato and essence, onion cream and brown butter. And Elmstein again: a fish and chips version with charr, “an outrageous, local variation,” says the master chef. Wonderfully well with this goes the fact that a skilful neighbour, Ms Ingrid Zinkgraf, designed all the crockery for the restaurant. And how about wines? “We are probably about the only star-awarded restaurant in the world that offers an exclusively Palatinate variety of wines,“ Hanno Rink tells us. The wine-cellar is stocked with wines from outstanding wine-growers such as “Müller-Catoir” or “von Buhl” but also with lesser-known ones. It is amazing what is possible, if you interpret the notion of regionalism in a meaningful way. 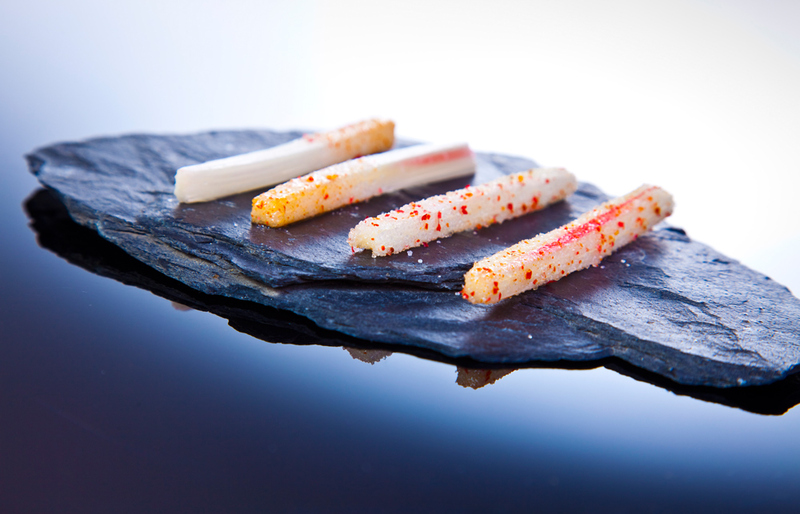 This may be the element that altogether made the Michelin Guides award the restaurant “Urgestein” a star. 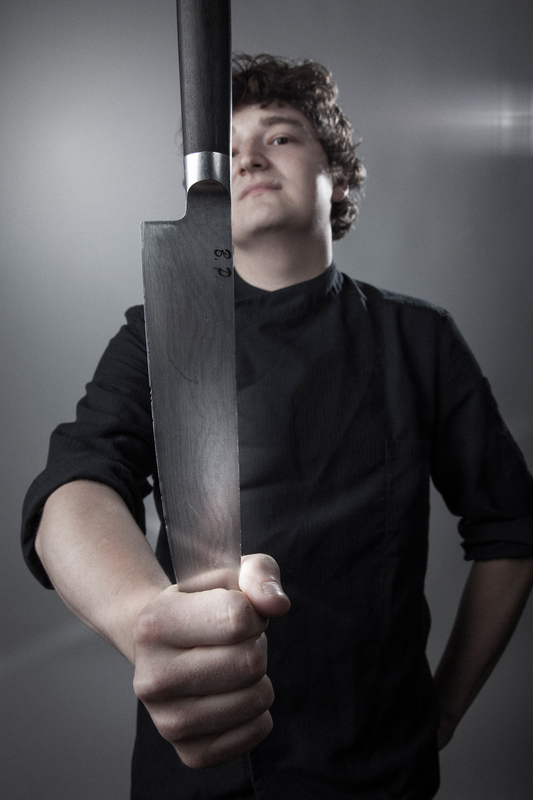 Benjamin Peifer was trained at a country inn in the town of Hassloch and then began his liaison with the haute cuisine at the hotel and restaurant “Ketschauer Hof” in the town of Deidesheim. He staked out his frontiers in the guesthouse “GästeHaus Klaus Erfort” in the city of Saarbrücken. “I was trained there for three-star cooking, but it’s not quite my speciality.” He learnt about regional-oriented cooking from Jean-Philippe Aiguer at the “Hofgut Ruppertsberg” farmstead. And at the “Paulinerhof” establishment, close to the city of Trier, he was awarded his first prizes: “Sieben Pfannen” (seven pans) from the magazine “Gusto” for the chef! At only twenty-three years of age. 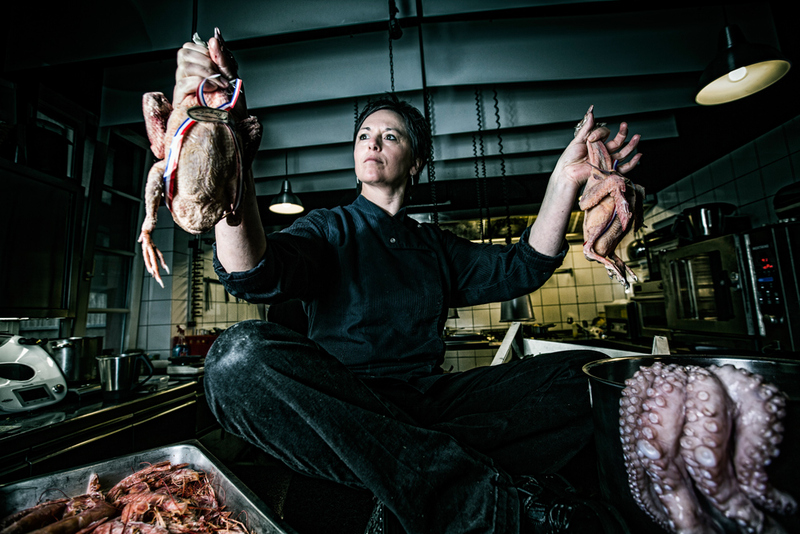 Hedi Rink, sous-chef at the “Urgestein” – only the best ingredients make it into her kitchen. “Urlamm” (primeval lamb) street food à la Benjamin Peifer: deboned lamb chop “BBQ” with Serundeng, peanut cream and lime peel, in the middle “Laab Gae”, minced lamb with fish sauce, chilli, vegetables and fresh herbs and on the right: scrag end, cooked for 12 hours at 65 degrees Celsius, with Kimchi, Edamame and lamb bouillon. Today, you need to book well in advance if you want to get hold of a seat in the “Urgestein”. The single and double rooms are equipped with carefully chosen furnishing and they provide the base for a gourmet weekend in Neustadt, so you can comfortably lie down after feasting deliciously and promenading through the old town. Besides, connoisseurs enjoy Rink’s “Jazz Club”. It shows virtuosos and rhythms from around the world. And there is another novelty: the “Urgestein Bar”, located in the oldest little house of the town, facing the alleyway. And here again, simplicity is king. “Our meals are meant to be no more than an accompaniment to the wine,” Benjamin Peifer explains modestly, “a couple of snacks, wicked and tasty.” Which means? “Home-made pancetta, for example, freshly sliced with the flywheel machine.” And what else? “Trout from the Palatinate Forest, but marinated like unagi and glazed.” The credo is: small meals, not satiating but happy-making. So much so that somebody might be tempted to sneak into the bar and pinch from the baker-cook’s bread. An act that should be forgiven tastefully.